I couldn't let the day go by without joining the FIVE on FRIDAY linky. Here's what I'm LOVING this week. 1. 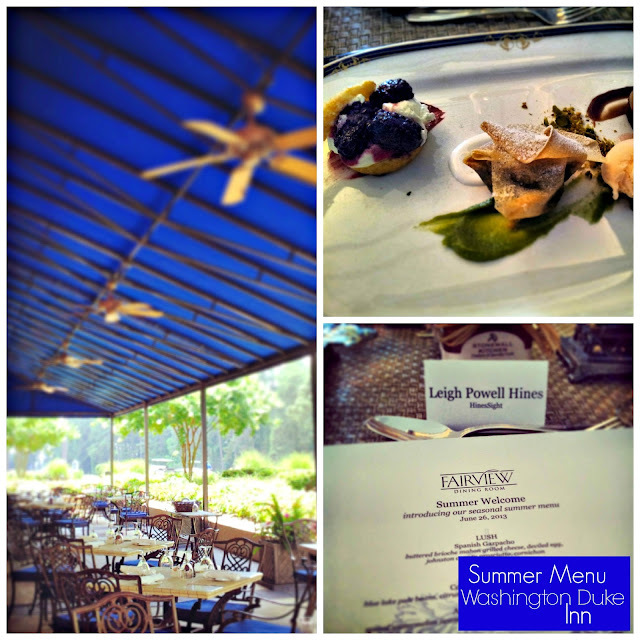 I am loving the Washington Duke Inn's Summer Menu. It's inspired by everything we love in the summer. Corn, tomatoes, watermelon, berries, kale. 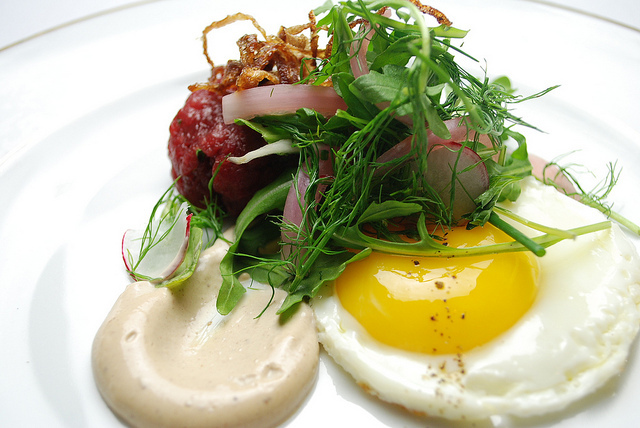 I got a first taste of Executive Chef Jason Cunningham's seasonal menu this week. I can't wait to go back and dine on this patio. You can bet that I will order the Blackberry Shortcake. It's been three days now, and I'm still talking about that dessert. 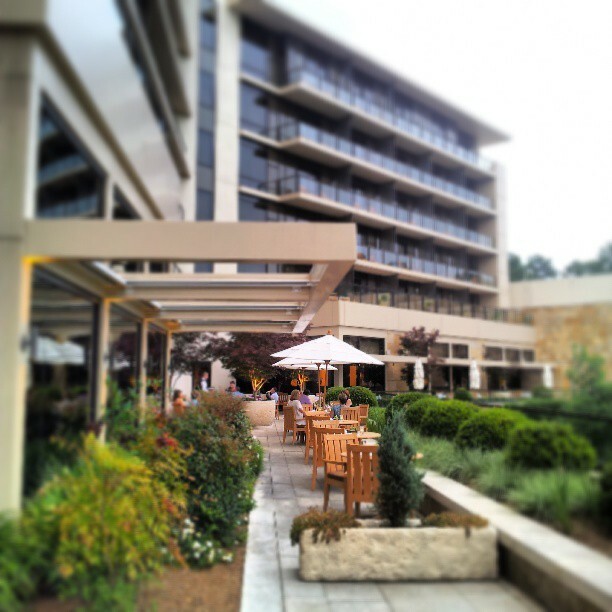 You can view the summer menu at this Four Diamond award-winning luxury hotel in Durham here. 2. I tried my very first Vesper Martini this week. It is the drink of choice for James Bond, and since I tell my kids that I'm a secret agent then it is only fitting that I fell in love with it, too. But, it was made with really good gin, and vodka. That makes a difference. 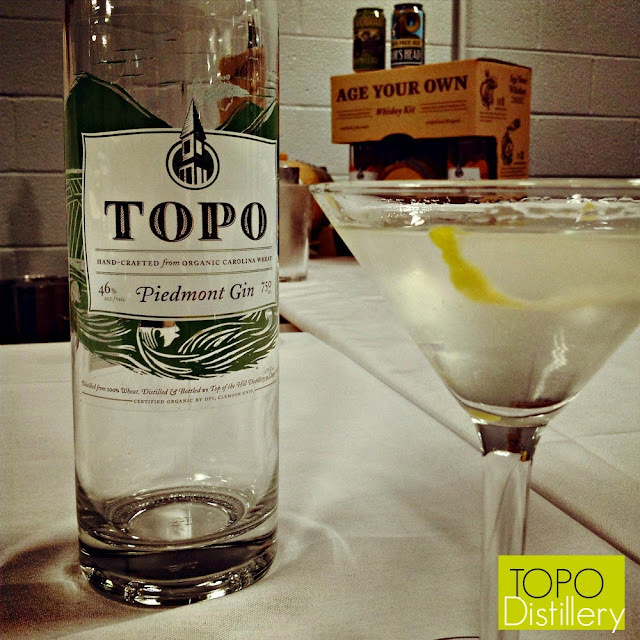 Will and I toured TOPO Distillery in Chapel Hill with several of my foodie blogging friends, and we were very impressed. Top of the Hill is the only distillery in the southeast that handcrafts and bottles its spirits from scratch using local and organic ingredients. We literally raised our glass, and tasted the difference of what 100% organic Carolina soft red winter wheat makes. It's GOOD! 3. I am loving the pop of Lilly Pulitzer in the lobby at the Carolina Inn in Chapel Hill. This Destination Resort hotel has undergone an extensive renovation, and I attended the relaunch party this week. 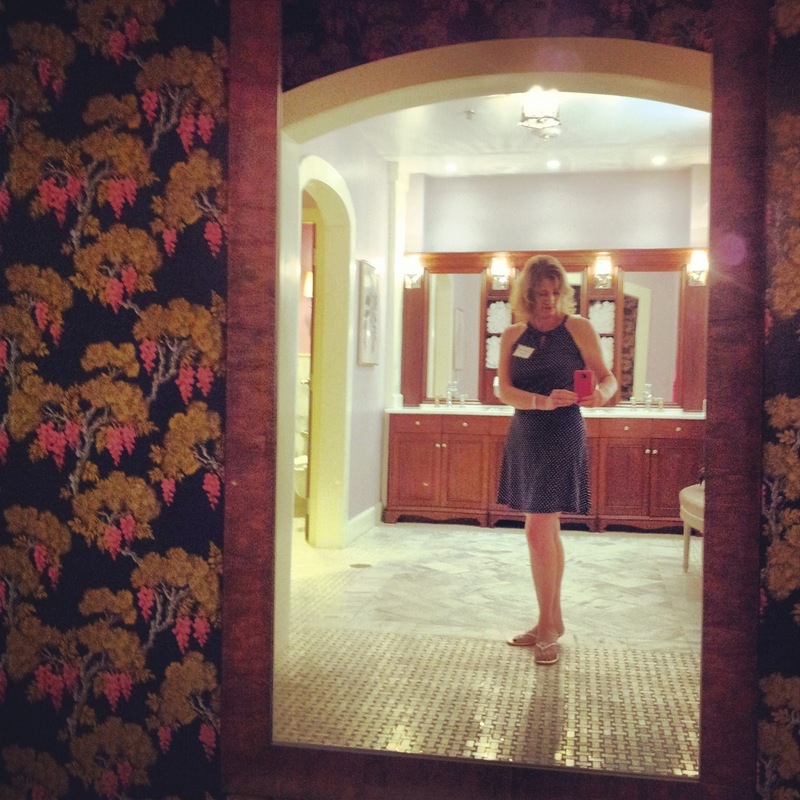 We dined in the Old Well room, and toured the newly renovated ballroom facilities, and guest rooms. I'm impressed with the guest rooms. They have a very residential feel, and the silhouettes of famous alumni add some historic pizazz. 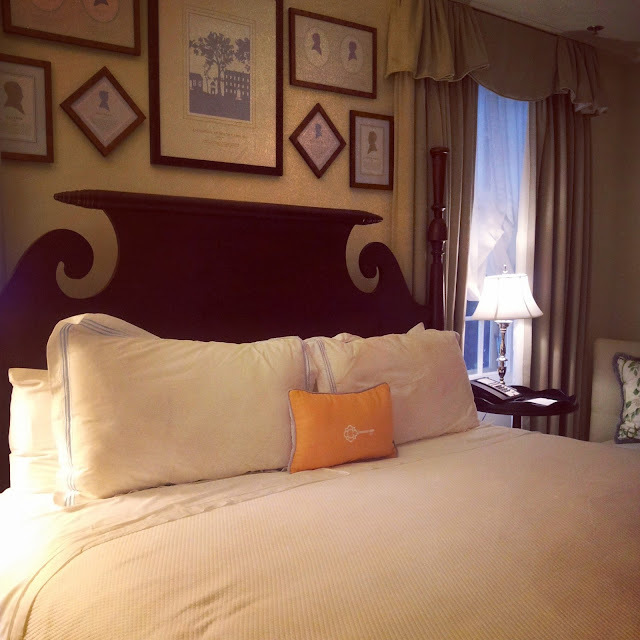 This is the Inn's sixth renovation since 1924. The full-length mirror in the hall bathroom is getting a standing ovation from me. For packages for an overnight, visit http://www.carolinainn.com/chapel-hill-special-offers.php. 4. I am loving Finnish Tuna Salad. 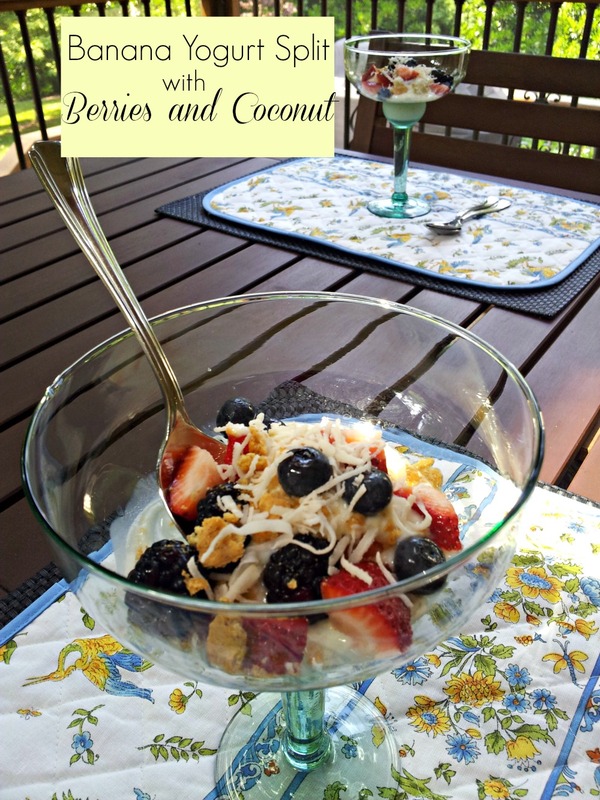 It's refreshing, and light for summer. 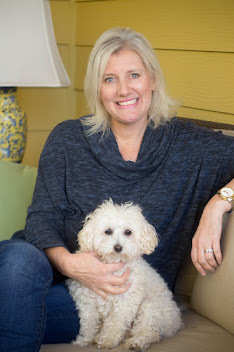 It's my editor, Katja Presnal's recipe. She is Finnish. Occasionally, I just crave it. I love to eat it inside a pita. I made it last week, and I love the crunch of the English cucumber and green apple. 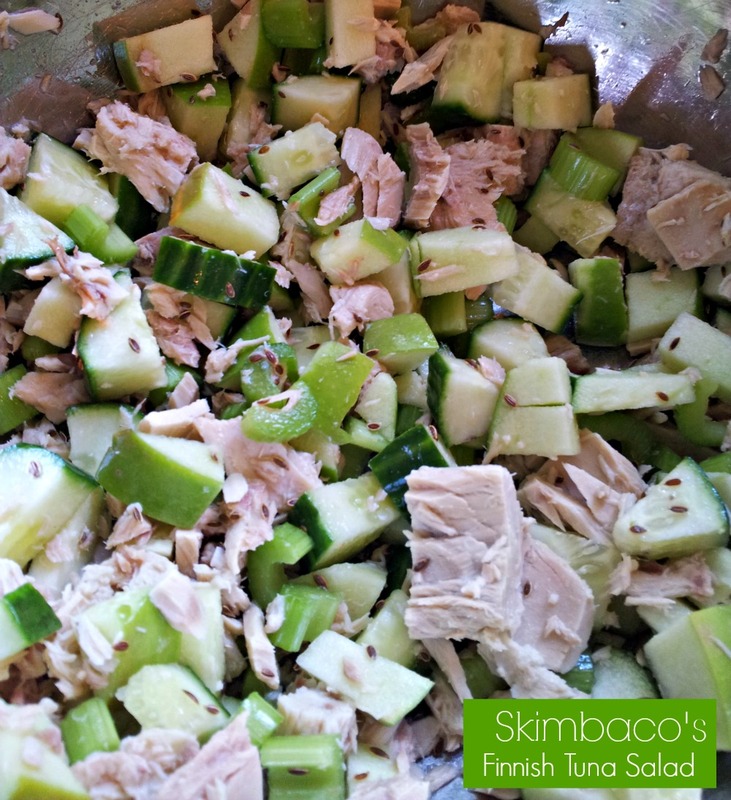 You can get her healthy Finnish Tuna Salad recipe here on Skimbaco Lifestyle. 5. 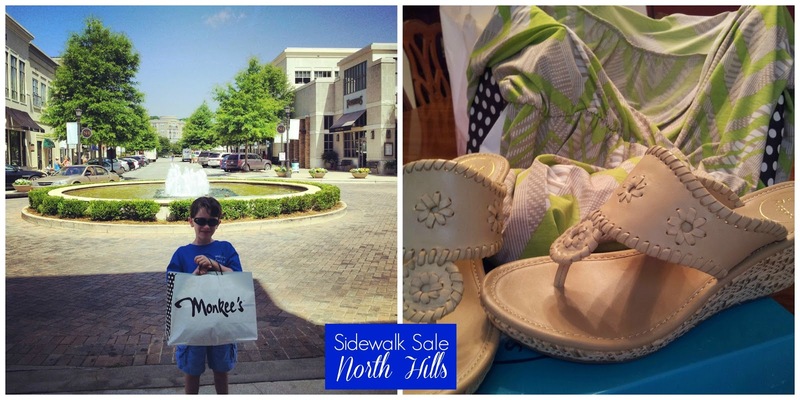 I am loving Summer Sidewalk Sales, and my personal shopper who helps carry my purchases. My 3-year-old was in Curious George camp, but my son did not have a camp today. We dropped my daughter off at 9:30 a.m. and the two of us hit North Hill's summer sidewalk sale. I was so proud of him. He did not complain once, and he even helped me pick out a dress on sale. And I scored some neutral shoes on sale at Monkee's, too. I call that a successful day. 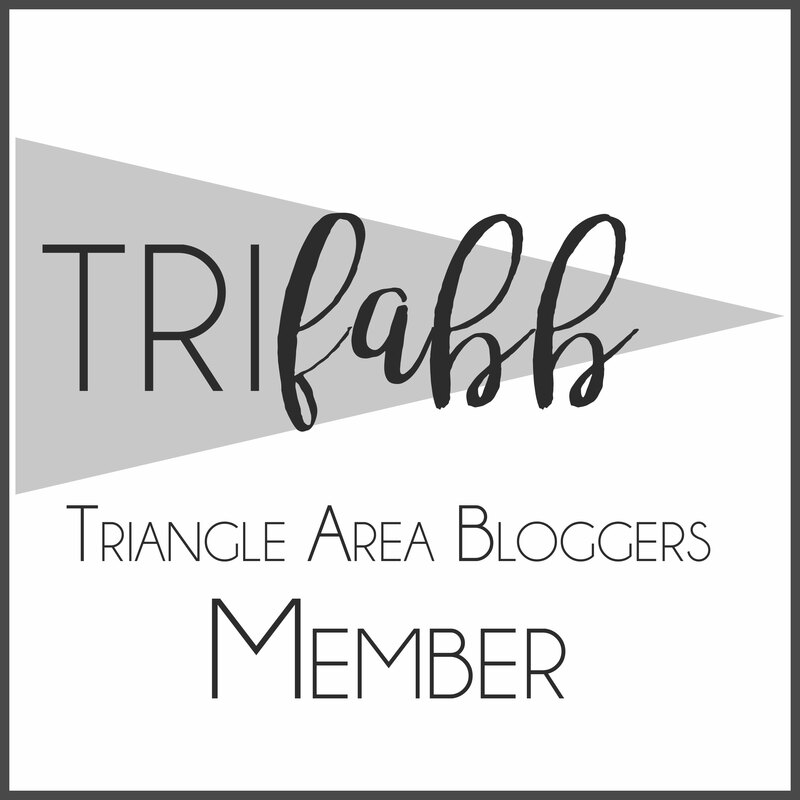 If you are new to the blog, please follow me on Facebook, Twitter, Instagram, BlogLovin or any of my social media buttons are on my sidebar. If you are just interested in post updates, you can sign up for e-mail. Happy to link up with the following blogs today. 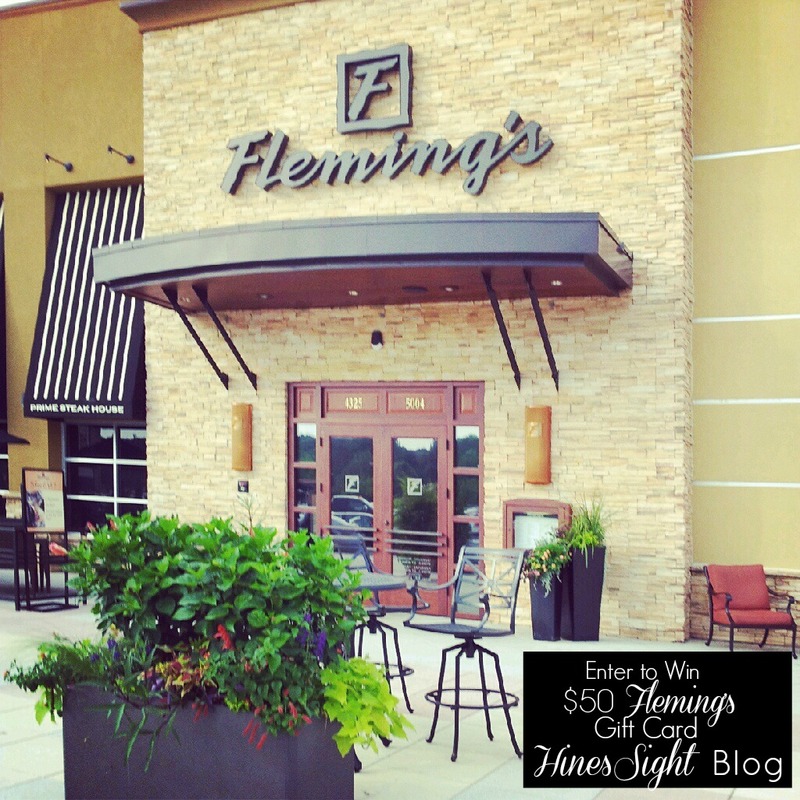 Fleming's Prime Steakhouse and Wine Bar is sponsoring this post by giving one reader a $50 Gift Card to the Raleigh Fleming's located at Crabtree Mall. 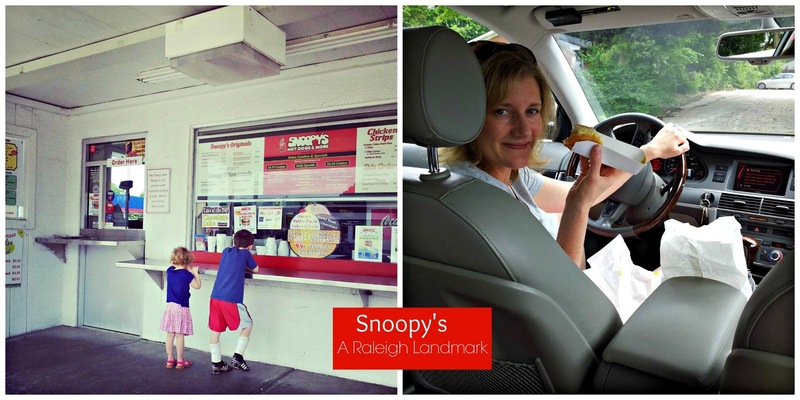 Fleming's is located in 28 states, and in 3 cities in North Carolina, but this gift card can only be used in Raleigh, N.C. If you are a wine lover, then this post is for you. I don't know a lot about wine except that I do like to drink it on occasion. 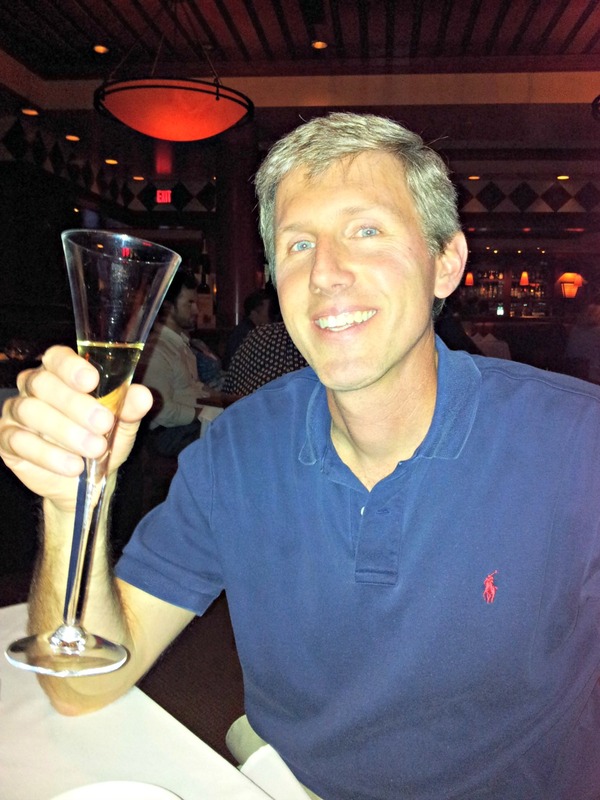 I tend to prefer red wine over white wine, but then Fleming's Raleigh wine manager, Charles Leary, always brings out a white wine for me to try when I visit the restaurant, and he shakes up my world. More often than not, I end up naming a white wine as my favorite of the evening. Charles invited me to preview the restaurant's new WiNEPAD last month, which was hot off Apple's assembly line and had just arrived at the restaurant for the public to use during dining. 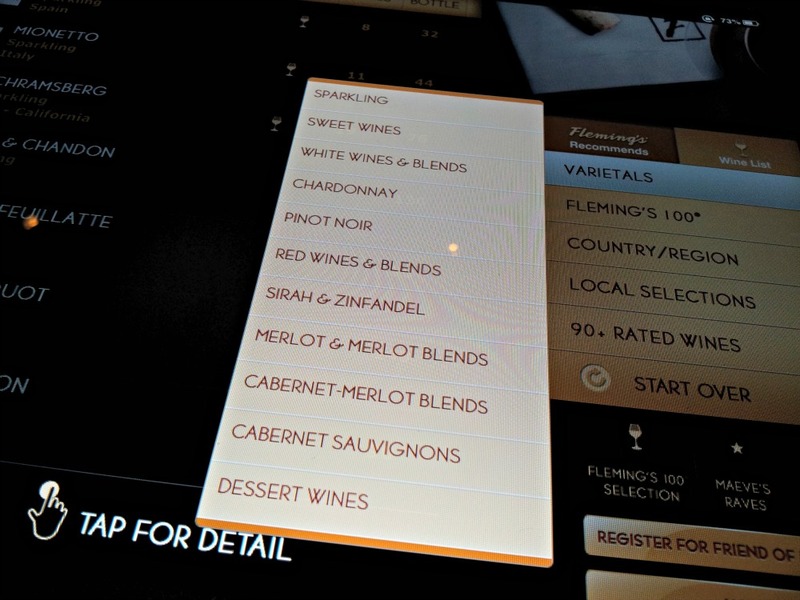 This WiNEPAD has been designed exclusively for Fleming's and is housed on a customized Apple iPAD. Seriously, it's like having your own little "Charles" at your table to help you select the perfect wine for your meal. I took my sidekick with me because he's my chauffeur, and we enjoyed an evening without the kids, learning about the 100 wines that Fleming's offers by the glass. Charles had Chef West prepare a few appetizers that we shared. 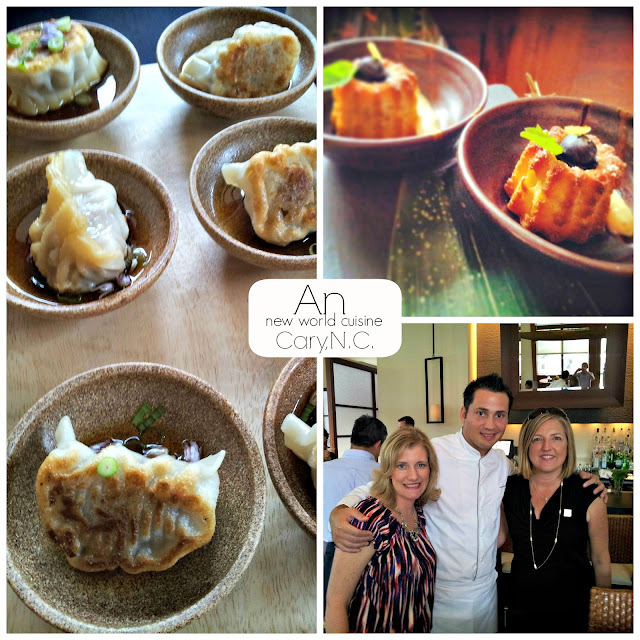 It was so much fun, and I came away with a lot more knowledge about the wines that I had with our appetizers. 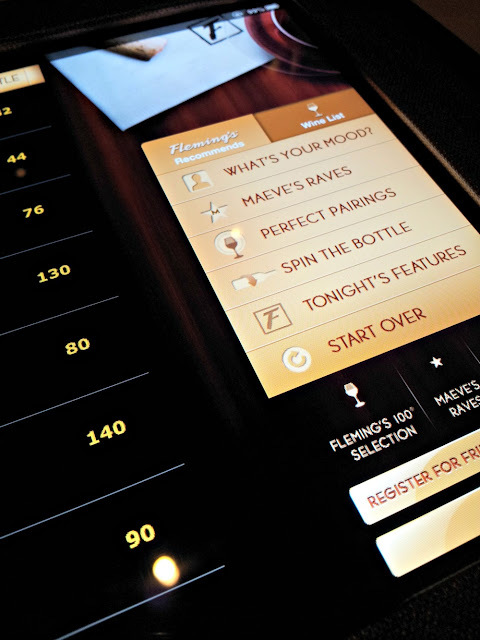 The WiNEPAD showcases wine and food pairings based on your food selection. If you are in the mood for the Lobster Tempura then it will show you three wine options that accentuate complementary flavors. If you are a risk taker, then you can play "Spin the Bottle." It will select a wine for you at random. If you really like a wine, you can even e-mail the name and your wine notes to yourself straight from the WiNEPAD. You never have to go home and say to yourself, "Now, what was the name of that wine I had again?" I have to tell you that Charles was quite impressed that I knew that the late actor who played "Daniel Boone" had a winery in Santa Barbara. Of course, Will had to spoil my fun by saying that I was obsessed with the TV show "Daniel Boone" as a child, and I knew a lot about Fess Parker. Honey! I was trying to seem smarter in front of a wine expert. Next time, sit back, and enjoy your $19 glass of sparking wine, and keep your lips sealed. Yes, Charles now has us hooked on expensive sparking wine. It was our first time trying really nice sparkling wine. I guess we just have great taste. 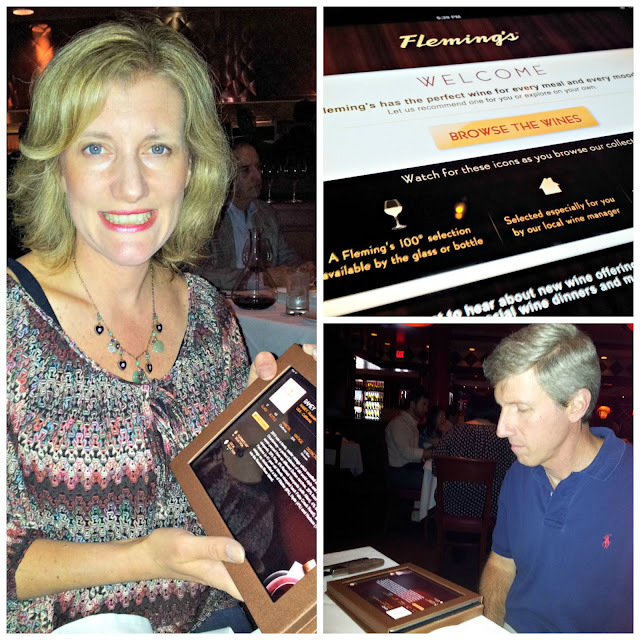 We had a fantastic night at Fleming's. 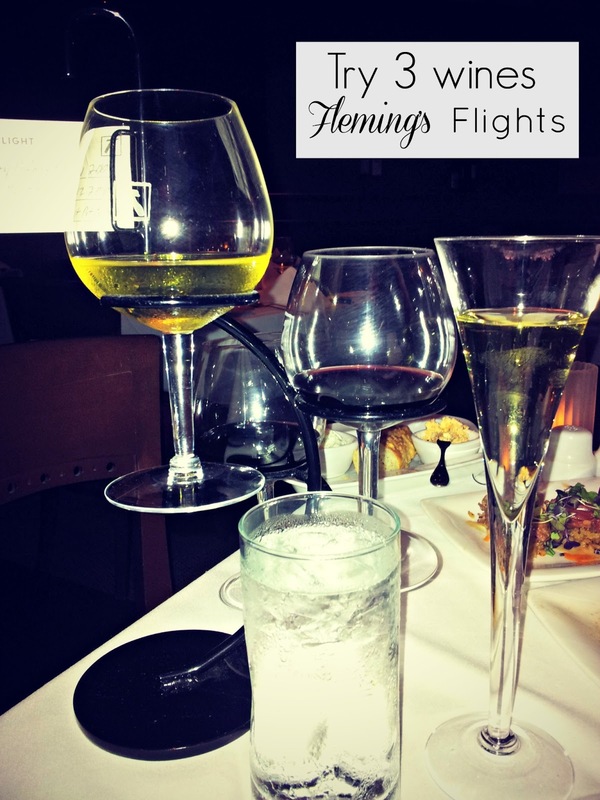 Enter to win a $50 Gift Card to the Fleming's in Raleigh and enjoy a night out like us. I think you will love trying out the new WiNEPAD. 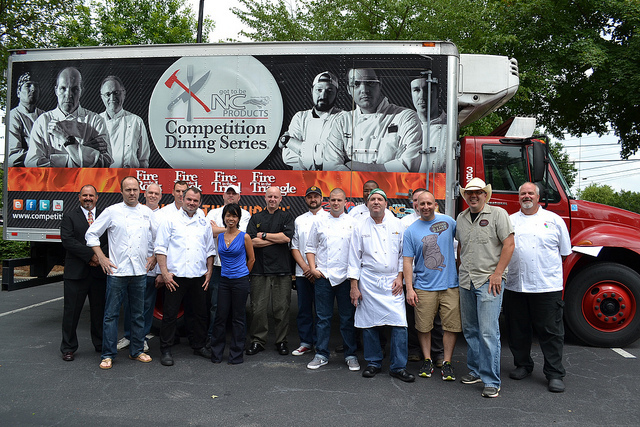 This contest runs from Saturday, June 15 to Saturday, June 29. This giveaway is hosted at HinesSight Blog. At the end of the contest one winner will be randomly drawn to win a $50 Gift Card to Fleming's Prime Steakhouse and Wine Bar. Entry is open to anyone over 18 years old in the USA. Unfortunately this prize can only be shipped within the USA, and can only be used at the Fleming's Prime Steakhouse and Wine Bar in Raleigh, NC. Upon drawing the winner, the winner will be contacted via e-mail. The winner has 48 hours to reply to claim their prize. If the winner does not reply within that time frame a new winner will be drawn. To enter the contest you must use the Rafflecopter options listed and verify your submission via Rafflecopter. The winner's entry method will be verified before being contacted. Failure to complete the entry option will result in being disqualified. This giveaway is solely sponsored by Fleming's Raleigh and HinesSight Blog. Extra Instructions for Rafflecopter system, if you have never used it before. 2. A box will pop up. Enter your name. Enter your e-mail address. 4. A box will pop up and give you choices to enter. Put your mouse on the +1 button. Click it. What do you do on the first day of summer vacation? 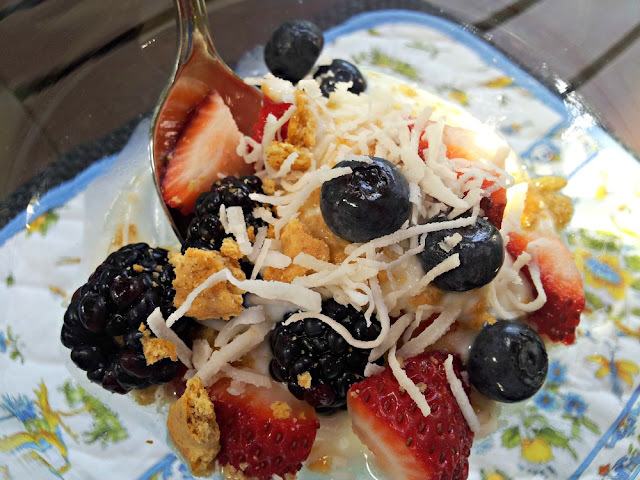 I'm sure many make a beeline for the pool, but if you live with me, you go out to eat breakfast. That's not really surprising, is it? 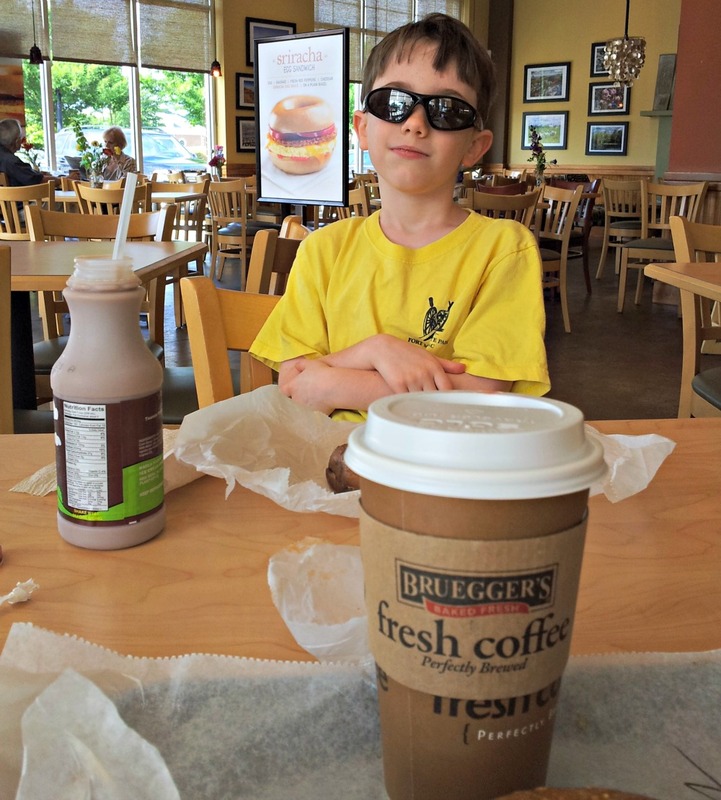 My son and I dropped my daughter off at her little preschool camp today, and we went across the street to have breakfast at Bruegger's Bagels. 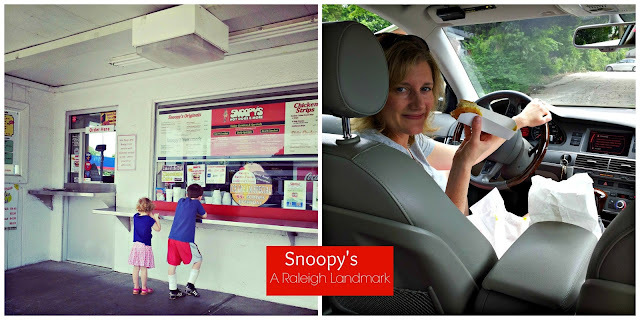 Earlier this year, I had the opportunity to meet Bruegger's Executive Chef, Philip Smith when he visited Raleigh. I got an e-mail from his staff a few weeks ago encouraging me to try some of his new menu items for summer. Apparently, they know I like to eat. I guess that was evident when I went for seconds on Chef Smith's delicious smoked salmon strata. They sent me some coupons, and of course, I put them in a safe place, and now can't locate them at all in my home. Does that happen to anyone else? Of course, I was disappointed that I couldn't find my coupons today, but Bruegger's is my neighborhood eatery, and I eat there a lot anyway. Coupon or no coupon. You may have heard that Bruegger's has a new "Sriracha Egg Sandwich" on the menu that includes eggs, cheddar cheese, sausage, red peppers, and sriracha, a tangy chili sauce. I have a confession to make. I've never eaten an egg on a bagel in my life. I will eat a hard-boiled egg in a salad and I will make egg salad, but that is about it when it comes to my egg eating. The Sriracha looked good, but I didn't want the meat, and the extra calories this morning. It was too early for me to try one of their new salads on this visit so I made an adventurous decision for me, and ordered an egg white and sundried tomato sandwich. Oh my goodness! I am an idiot for not trying an egg on a bagel sooner. It was delicious. I feel like I've been missing out on something for 44 years now. I guess the entire world knew something that I didn't know. An egg on a bagel is darn good. I will definitely order it again. It has less than 500 calories, but if I had ordered it "skinny" then it would have had about 100 less calories. I honestly stayed full for six hours later. I guess I let Chef Smith down by not trying his new spicy breakfast sandwich. I hate letting an Englishman down, too because he has that great British accent,and all. I'm sure it is wonderful. I hope you try it, and let me know how it is. In the meantime, I'm quite happy about my new breakfast find, and I look forward to trying the new Blue Apple and Chicken Almond Salads. Disclosure: Bruegger's asked me to try some of their new menu items. They sent me some coupons, but I put them in a place so safe in my home that I can't find them now. 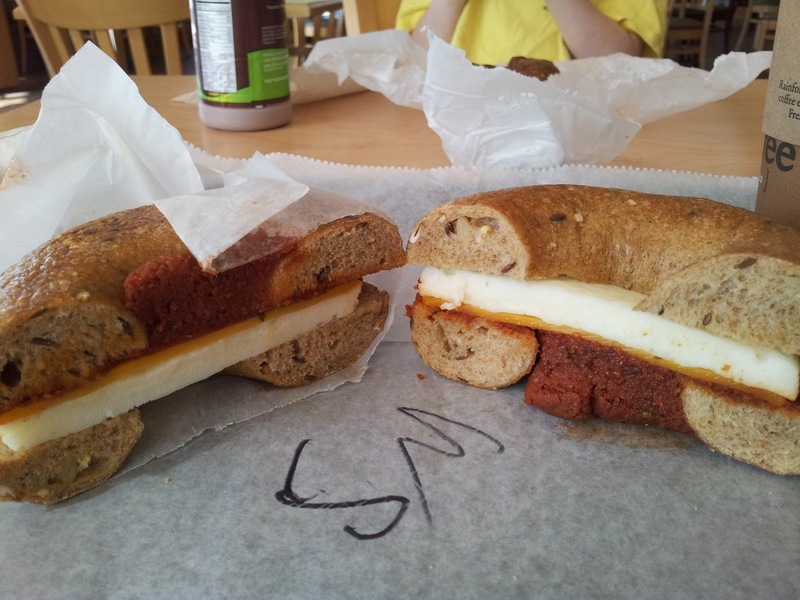 I paid for our own breakfast at Bruegger's, and my opinions are my own. I will definitely try the new salads at some point because I do frequent Bruegger's often. A quick hello to you. I'm back from Toronto. 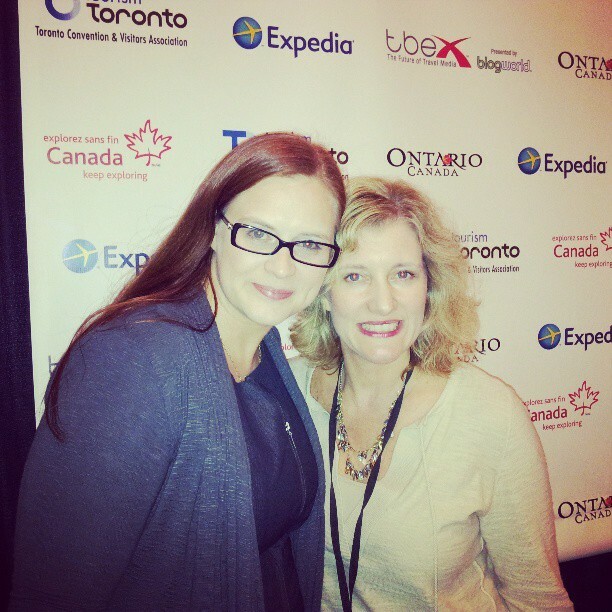 It was an amazing experience for me to attend my first TBEX conference with Katja Presnal, my editor at Skimbaco Lifestyle. I have to be truthful. 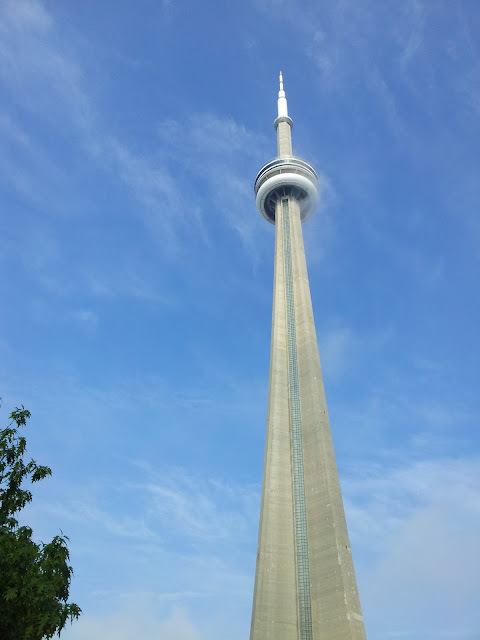 I didn't see much of Toronto. So, if anyone tells you that they travel all the time when they attend conferences, they aren't really getting the full experience of travel. 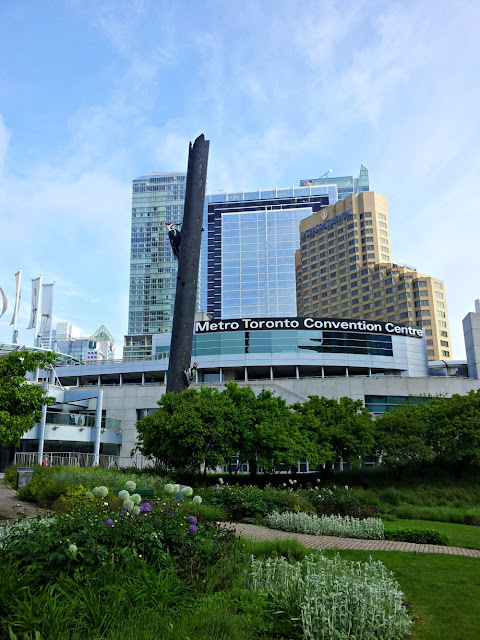 I spent about 12 hours of the day at the Metro Toronto Convention Centre. Luckily for me, this was on my walk to the centre. And Katja Presnal is an amazing speaker. Don't forget that you can get her brand new book on "Instagram as Your Guide to the World" on Amazon. It's a great read. The nice thing about this conference for me was, of course, my hotel, The Hotel Le Germain Maple Leaf Square. 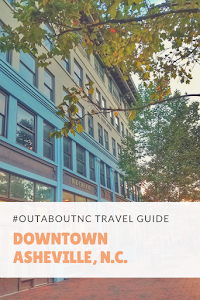 You will hear all about it in my "Pack Your Bags", but I will go ahead and reveal that I loved my stay. Hotel staff make this hotel special. I already revealed on social media the answer to the buzz behind the gigantic, half-clothed man above the bed on the wall in my room. There were a lot of pro and con comments about the artwork. 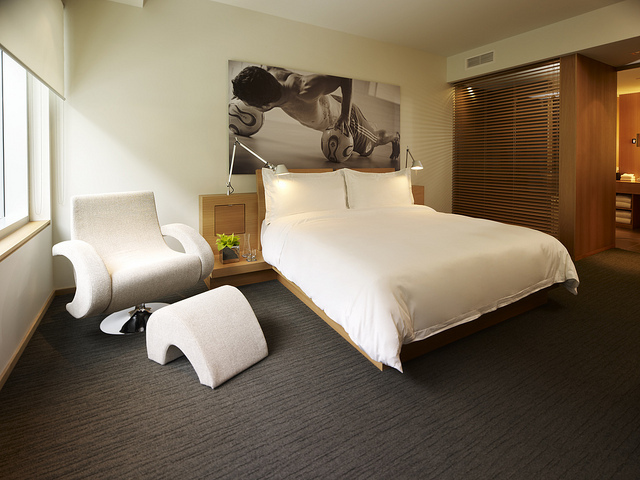 Hotel Le Germain is in Maple Leaf Square, which is home to the Air Canada Centre, Toronto's professional sports arena. The photographs in the room are of 28 different professional Toronto basketball, soccer, and hockey players who posed for the photo shoot by a local photographer. The entire hotel has a "play" and sports theme, and in my opinion, it works well for the hotel. My guy wouldn't talk back to me. Like any artwork, it eventually blends in with the room and you forget the art is there. Since I was by myself, I talked to my guy. Unfortunately, he wouldn't rub my feet, and they really hurt from walking. To answer the question that some of you posted on Facebook and Instagram, I felt the artwork worked for the theme of the hotel, and it did not distract me all. You will get my full "Pack Your Bags" later, but that is just a quick update about a conversation that was started before I left for Toronto. While I was in Toronto, I had a new idea and decided to try to get you all to play along with me this summer. SO PLEASE DO. I would LOVE it. A Double Queen Room set up for a family at Hotel Le Germain. Love the special Angry Birds pillows. As you travel this year, I would love for you to share your resort, room, or vacation rental with the HinesSight community. 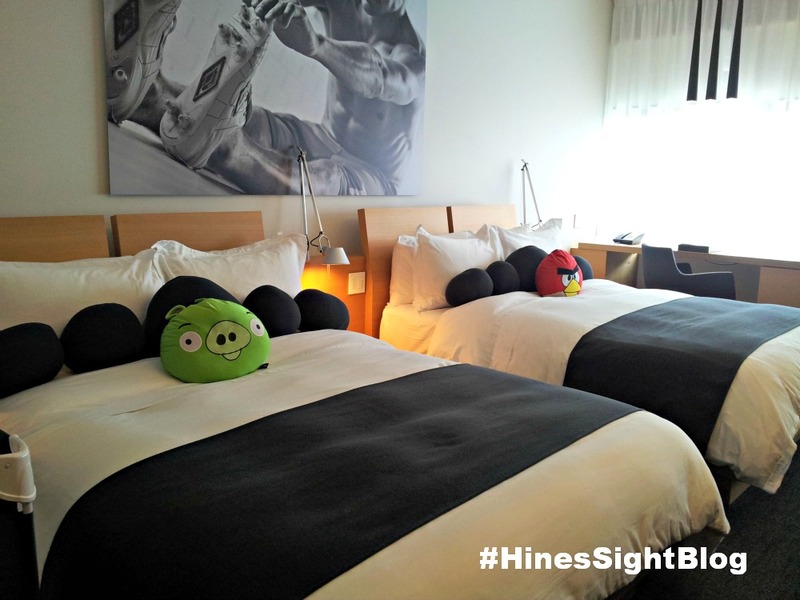 You can use the hashtag #hinessightblog on Instagram and Twitter. You can upload your photos to the blog's facebook page or tag the photos with the blog's facebook page. I will even share some of them with my readers. 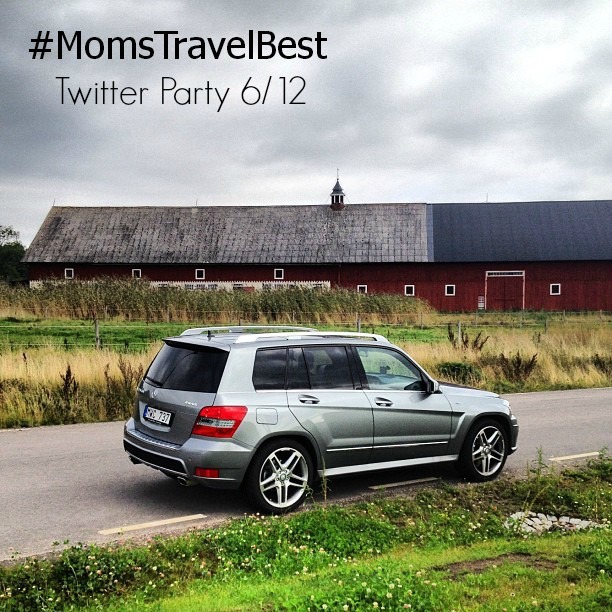 I think this will be a great way to show hotels, vacation spots, or fabulous rentals. Sometimes I hear from you and you say, "I thought of you while I was at this resort." I love to hear that. Nothing pleases me more than to know that you thought of me while at a hotel. Wow! That's special to me. So, while you are on vacation, please snap me a photo of your room to see. 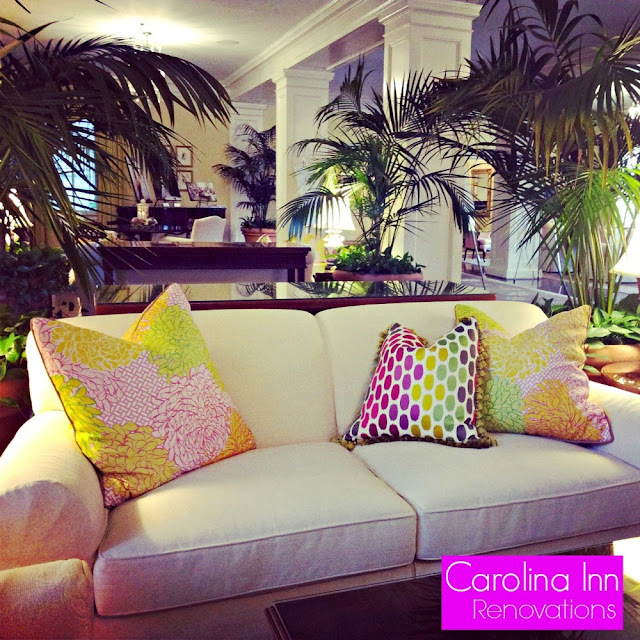 We would love to see the decor, the pool, or anything about the hotel or vacation property. Hotel Le Germain's General Manager snapped this photo of me in one of the room's modern chairs while we toured the property. Yes, I'm truly my happiest in a luxury hotel. Before I went to Toronto, I shared the following photo from the hotel, and a reader jokingly told me she thought the chair looked dangerous. 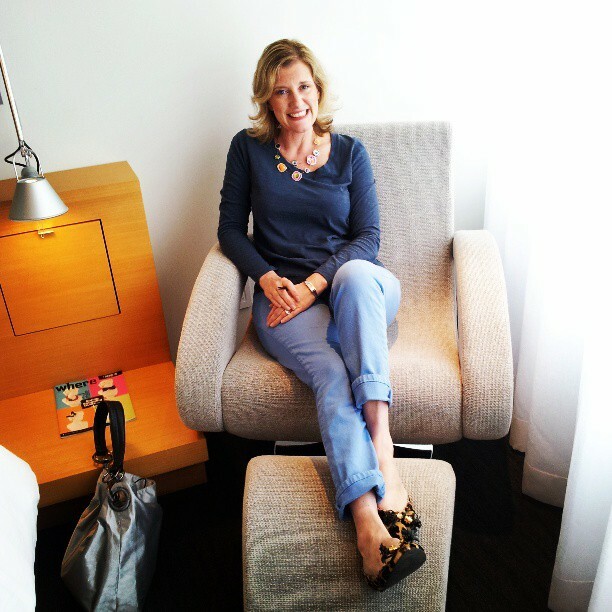 It's quite comfortable, however, I loved the chair even more in my own hotel room, and you'll hear the story behind that chair in my upcoming "Pack Your Bags" feature later this month. It will be fun to see where you all are going this summer for vacation. I hope you play along. Show me your Room! Show me your Resort! Show me your Suite! Show me your Vacation Rental! Tag it #hinessightblog on Instagram and Twitter. Tag my blog's page on Facebook page or upload them directly to the Facebook page. One travel photo has already been uploaded to twitter. 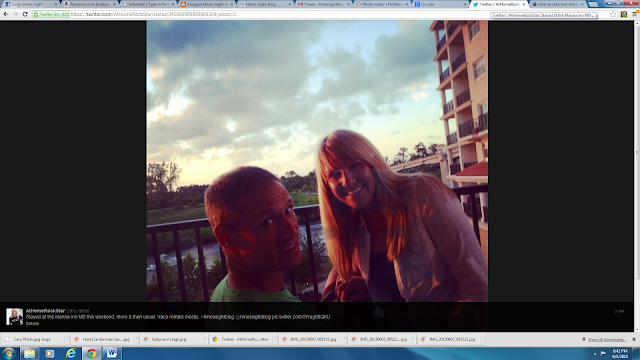 It's from @AtHomeRockStar in Cary, N.C. She visited the Marina Inn at Grande Dunes in Myrtle Beach, SC. She loved it. She said that she splurged on this hotel, and felt it was worth it. 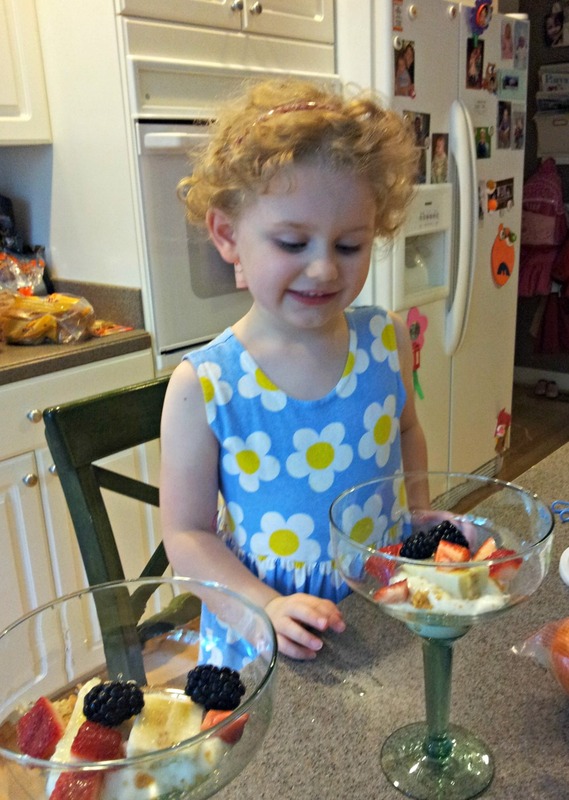 She thinks it is perfect for a romantic getaway more so than for a family getaway. Thanks, Cary! I have to leave you with one more photo. 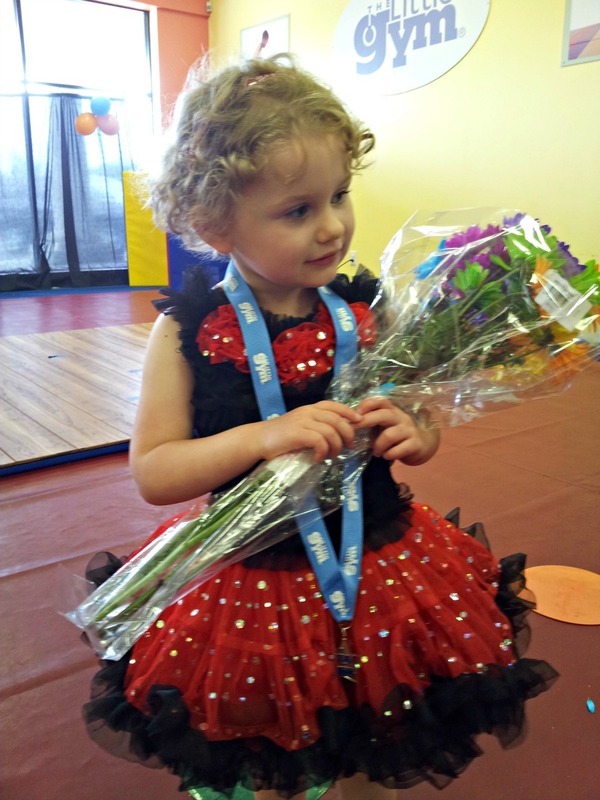 My 3-year-old had her first dance recital yesterday. She was really cute. She stopped half-way through her routine, and of course, wasn't always on the beat, but I was still a proud mom nonetheless.